If you finished that sentence by singing “is Folgers in your cup!” we’re officially best friends. 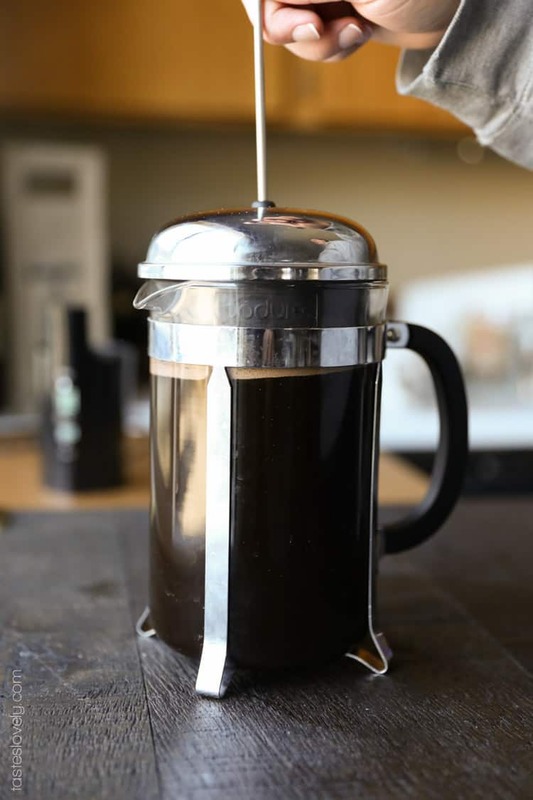 Have you tried making coffee with a french press? You must! The flavors are amazing. So amazing, that I don’t even own a coffee pot, or one of those super futuristic Keurig machines. Nope, all I need is my beloved Bodum French Press and I’m all set. It takes up so much less room in the kitchen, and it makes you a deep, robust, flavorful cup of coffee. Clean up is a breeze too. And what goes better with coffee than coffee cake? We all know I’m not much of a baker, but luckily my friend Caitlin at teaspoon is an amazing baker and has us covered with a delicious raspberry coffee cake. Valentine’s Day isn’t just about the guys, it’s about celebrating your friendships too. Caitlin and I are old friends. As in, friends-since-elementary school old friends. 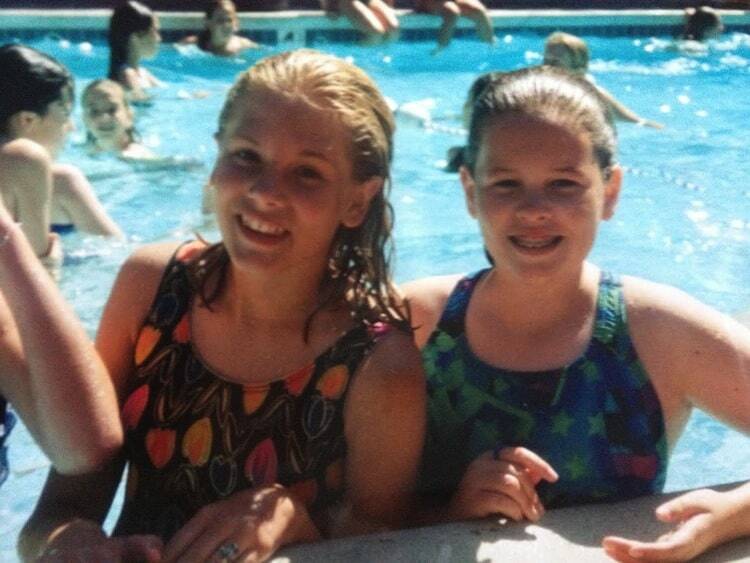 Check us out rocking the heck out of one-piece swimsuits at our 5th grade graduation picnic. Sorry fellas, we’re both married now. Caitlin got married last year, and has been living in Zurich, Switzerland with her new husband Jon. Doesn’t that sound so exciting? So since we are living too far apart to get together, Caitlin and I are having a little virtual Valentine’s Day brunch. I’m bringing the french press coffee, and she’s bringing the raspberry coffee cake. And in true girly fashion, we’re sharing some of our favorite Valentine memories. Caitlin, what’s your favorite way to spend Valentine’s Day? My favorite way to spend Valentine’s started four years ago when our group of friends decided to go to a bottomless mimosa brunch in San Francisco. We were all single and figured we could use Valentine’s Day as an excuse to celebrate. We quickly found out there was actually a bottom to the mimosas, so we headed to another bar, and then ended up at the karaoke bar to sing the night (well, late afternoon) away. It turned out to be the most fun Valentine’s any of us had ever had, probably because it was so unexpected, so we have tried to re-create it ever since. The past three years, even though many of us have coupled off, we have gathered everyone for our Valentine’s mimosa brunch and karaoke to continue on the tradition. Now that we have moved abroad, we are sadly going to miss it, but hopefully they continue on without us. Caitlin, what’s the best Valentine gift you’ve received? As for gifts, I usually insist that they have to be homemade and under $10. My husband doesn’t like this because he is a perfectionist and can’t spend less than 10 hours on any project, while I just whip something up in an hour or two. But, the first year we did homemade gifts, he made me a paper model of my Nikon camera (I had just started to get really into food photography for my blog), and on the back of the camera, it held pictures of us that he made into polaroids with nice handwritten notes on each. He is not normally romantic, so I was definitely in (happy) tears while reading the notes. He looked at me all confused, like “what did I do wrong?” when really he had got it more than right! Caitlin, what are your plans for Valentine’s Day this year? 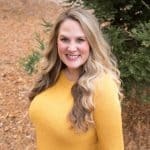 Be sure to head over to Caitlin’s blog to snag the recipe for her drool worthy raspberry coffee cake, and to read my answers to our little Valentine Day brunch chat. Check back often to read about her exciting adventures in Switzerland and to see what she’s cooking up next. Happy Galentine’s day to you and your girlfriends! 1. Medium grind your coffee beans until they resemble course crumbs. You do not want to grind them too fine or they will go through the strainer on the french press and make your coffee grainy. 2. Boil your water in a tea kettle until just before boiling, or microwave on high for 5-8 minutes, until the water is hot but not boiling. I took the temperature of mine and it was 205 degrees. 3. 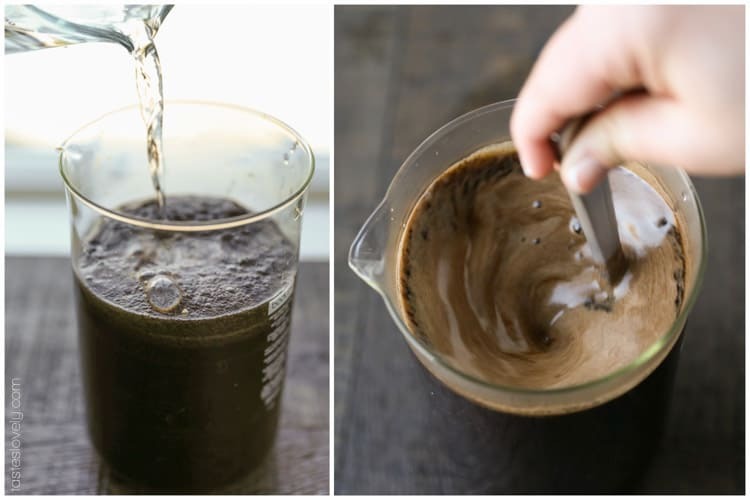 Pour the coffee grounds into the bottom of your french press, then pour in the hot water and stir vigorously to combine. Allow to steep for 5 minutes (do less time if you prefer a lighter bodied coffee). After steeping, press the coffee to separate the coffee grounds from the liquid. 4. Serve immediately while hot. 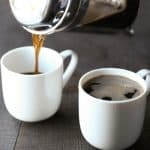 Flavor your coffee with cream and or sugar if desired. I love how dark and rich this coffee looks. I remember when my coffee maker broke I started to make coffee in a tea kettle and it tasted so authentic that way. It reminded me of the Middle Eastern coffee in the middle east ( which is AMAZINGGGG btw). Girl, your friends can bake! That cake look fantastic! That’s so smart to make your coffee in a tea kettle! Did you just strain it out after it steeped. Smart girl. I bet I would love middle eastern coffee. Isn’t my friend a great baker? I can’t wait to make that coffee cake! Isn’t french press coffee the best Sarah? It’s spoiled me. Now drip coffee is just so-so. It is definitely a little stronger than drip coffee, so I add a splash of creamer and sugar. Then it’s perfect! And doesn’t Caitlin’s raspberry coffee cake look so good? She’s a great baker. I can’t wait to make it! That’s so nice that the two of you are still friends. The raspberry cake looks so delicious. I do not have a french press, but Kurt recently bought me my own very own professional coffee maker. What coffee brand do you use? I am loving the throwback photo! Those are always the best. I agree that Valentine’s Day is also a great time to celebrate friendships. Or in the words of Leslie Knope from Parks and Rec, “Galentine’s Day!” :) So fun to celebrate your friendship with Caitlin with a virtual brunch! Your sister is right! French press is the best. It’s perfect for just the 2 of us on weekend mornings. I love when you get to “press” the coffee. Makes it feel even more homemade. You must try it! Isn’t that picture so funny? I found SO many pictures of us, some were quite embarrassing. Hello super flare jeans! And thick bangs. Oh dear. And I was totally thinking of Galentine’s day from Parks and Rec, you read my mind! Where is the recipe for the Raspberry Coffee Cake? Teaspoon says she doesn’t have a recipe for Raspberry Coffee Cake…. She was a little late posting the recipe to her Raspberry Coffee Cake. But it’s up now! It looks so good. I can’t wait to make it. What a cute, fun post! Valentine’s is definitely about celebrating all sorts of love, and I just love LOVE too much not to spread it around! 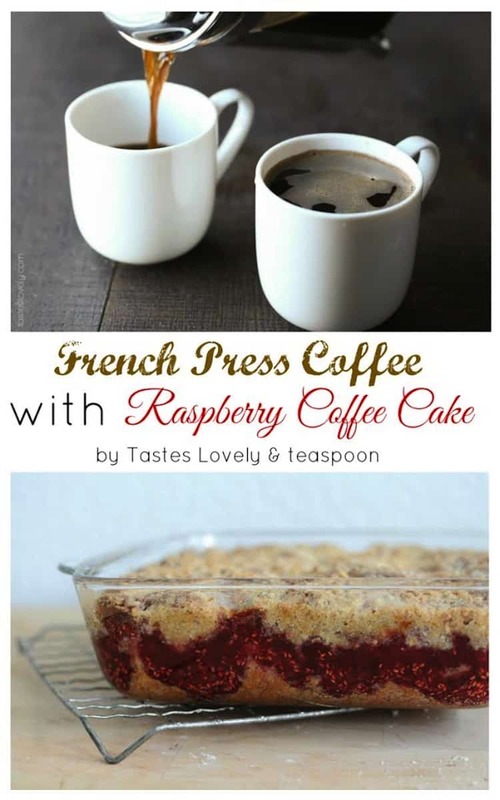 The French press coffee sounds awesome, and I will have to get my eyeballs on that coffee cake . . . looks fantastic! Thanks Meg! French press coffee is the best. It has spoiled me. Now drip coffee tastes like water. Haha! And doesn’t Caitlin’s coffee cake look fantastic? Can’t wait to make it! You must try it Melanie! It makes drip coffee seem like water in comparison. Haha, well I guess we’re best friends now.. We finish each other’s sentences, already! I’ve always wanted to French press my own coffee! The raspberry cake looks delicious and your plans for Valentines Day this year sound fun!! We have a bodum french press too! 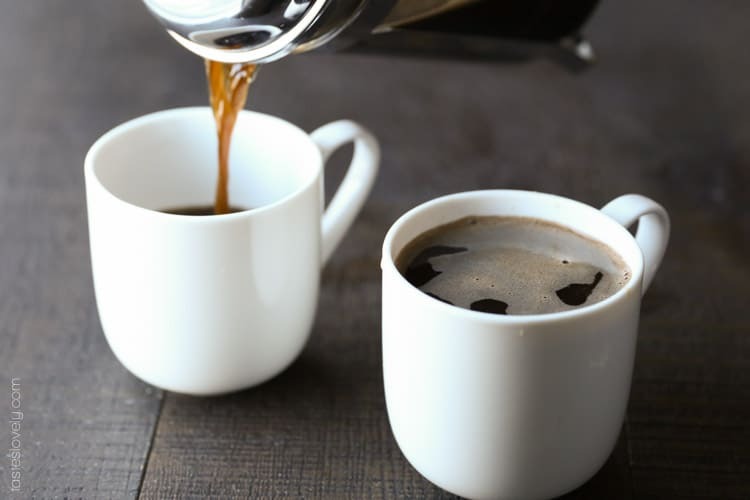 my husband is obsessed with french press coffee – i’m a bit more particular about the roast that goes into the french press :) either way, i’m a coffee fiend!!! I am besties with my french press too! This post has me looking forward to my morning cup(s). I don’t drink coffee, but I love how cute that little french press is! Love that it doesn’t take up counter space, too! What a sweet post, Natalie! Love that you’re honoring the special “Gal-“s in your life, too (amid all the lovey-dovey this time of year). And anything that deals with coffee in any form is a favorite. 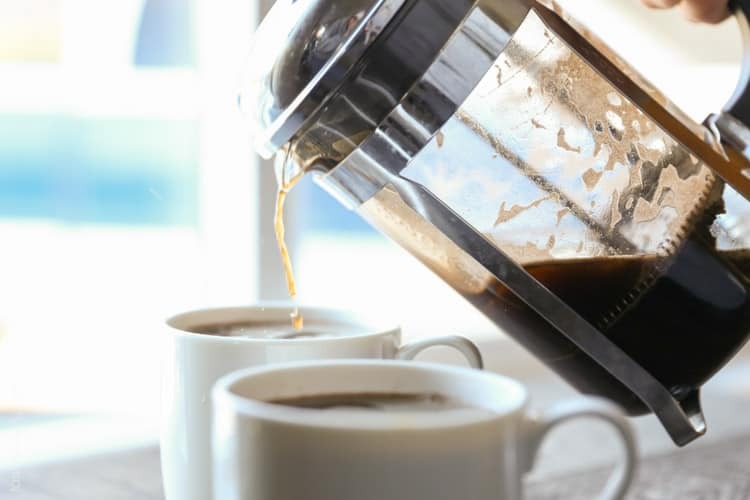 We have a French press, although in the rush of the mornings we tend to utilize a pod-coffee maker instead (quicker…and no mess to clean up after work). This is inspiring me to break out the French press this weekend! Also it has totally saved us when we’ve had extended periods of time without power. We were able to boil water on our gas stovetop and voila – caffeine-withdrawal headaches averted! Haha, I totally finished that sentence without even thinking about it! This is such a cute idea! So great that you could celebrate with an old friend and I totally have some awkward 5th grade graduation party pictures laying around too. I have another snow day tomorrow, so french press coffee sounds perfect! What a cute story and so sweet that you guys are still friends :). I don’t have a french press but could definitely see myself becoming best friends with it! And your raspberry cake looks very yummy and perfect alongside this coffee. 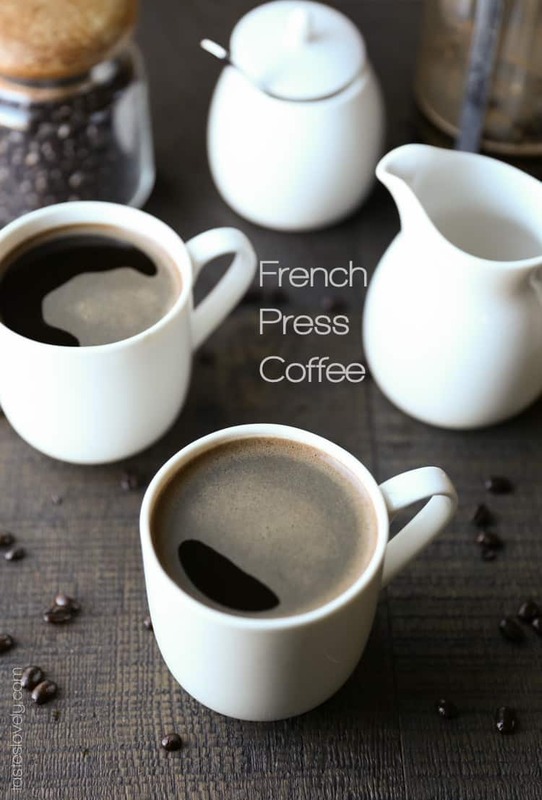 we love our french press, although our espresso machine takes the first place! great cake btw!